Shortly after unlocking occurs, the barrel (which is still moving to the rear of its own momentum) strikes the accelerating device (fig. 2-14C). This device can take many forms, but in the mechanism illustrated, it is a lever pivoted in the breech casing. Fig. 2-15 shows the action of this lever in detail. In fig. 2-15A, the barrel extension is just in engagement with the lever and in fig. 2-15ft the lever has been rotated to where it has started to thrust on the bolt. As the barrel continues moving to the rear, the lever rotates and the point of contact between the barrel extension and the lever moves closer to the lever pivot (fig. 2-15C). This causes the top of the lever to move more rapidly, thus imparting a high acceleration to the bolt. When the accelerating action is completed, the barrel strikes a buffer stop which absorbs the remaining recoil energy in the barrel and its associated parts. After the barrel has been stopped, it is latched in its rearward position so that it is not immediately driven forward to battery by the compressed barrel return spring. The combined action of the accelerating device and the blowback produced by the residual pressure imparts a high velocity to the bolt and then the bolt continues to move to the rear of its own momentum until the opening between the barrel and bolt is sufficient to permit feeding. As the bolt moves back, the spent cartridge case is extracted from the chamber and ejected and the bolt driving spring is compjressed. This spring is relatively light and its only function is to assist the return motion of the bolt. Therefore, the driving spring does not absorb any great portion of the kinetic energy of the recoiling bolt and the bolt moves through its entire recoil distance at high velocity. The bolt then strikes the backplate buffer and rebounds. The forward velocity of the bolt immediately after leaving the backplate is somewhat less than the velocity at which it strikes the backplate because the impact is not purely elastic and some energy is lost as heat in the exchange. arc accomplished in a very short time. 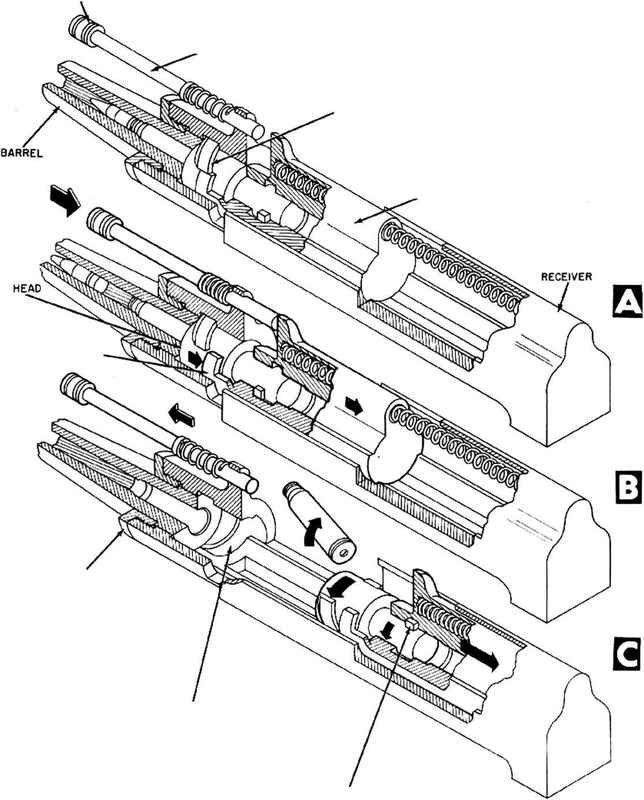 From the foregoing, it is evident that the bolt velocity in a short recoil gun is determined by three separate factors: (1' the recoil velocity at the time of unlocking, (2) the additional velocity imparted by blowback, and (3) the additional velocity resulting from the action of the accelerating device. In the following paragraphs, each of these factors is analyzed separately.